Government officials in Colombo have just announced that they will be using homeopathy for the treatment and prevention of dengue fever in high risk areas. Local residents have welcomed the news. Homeopathy is used as a safe, simple and low cost option in the management of this disease. Early symptoms of dengue fever consist of a headache, muscle and joint pains, weakness, and a rash. Because of the intense bone pain experienced by many sufferers, it is also known as ‘breakbone fever’ or ‘bonecrusher disease. 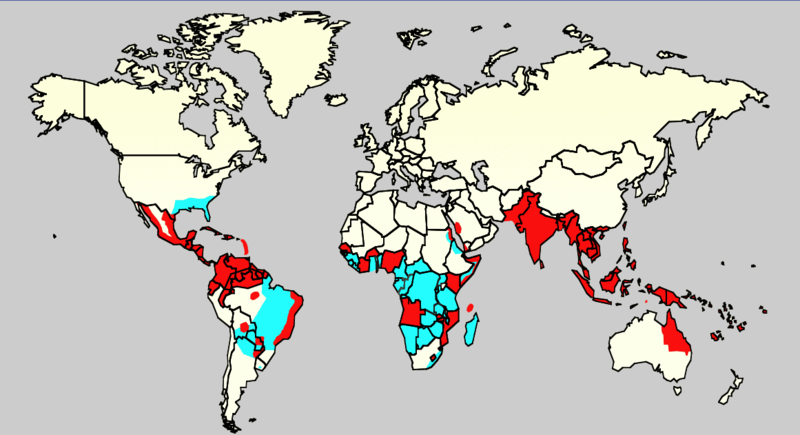 Dengue fever is most common in tropical areas but also reaches upwards into parts of the USA and downwards into Australia. Over the past 30 years, dengue transmission and the frequency of dengue epidemics around the world have increased. The following map shows current dengue-affected areas. Most people recover from dengue fever within 7 days but a minority progress to a more severe form of the disease called dengue haemorrhagic fever in which the blood fails to coagulate. Blood may seep from the eyes, into the lung and abdominal cavities, and even through the skin. Blood pressure drops, shock follows, and death is common. There is no vaccine for dengue fever and conventional treatment is symptomatic. Remedies commonly used by homeopaths in the treatment and prevention of Dengue Fever include: Chininum sulphuricum, Dengue fever nosode, Ledum palustre, Eupatorium perfoliatum, and Pyrogenium.